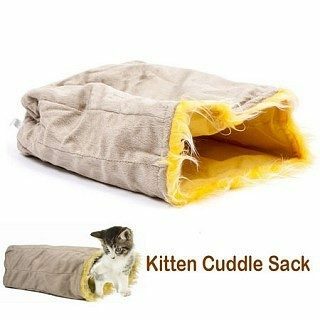 Kitten Cuddle Sack Just $5.99 PLUS FREE Shipping! You are here: Home / Great Deals / Kitten Cuddle Sack Just $5.99 PLUS FREE Shipping! This Kitten Cuddle Sack will be a great permanent substitute for plastic bags; not only warmer and safer but the concealed inner material crackles for your cat’s fun! It also makes a great private bed! You can get this Kitten Cuddle Sack for just $5.99 PLUS FREE shipping!